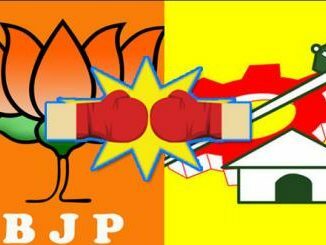 TDP and BJP have remained ally till now. TDP and BJP have already been criticized for allocation of special funds and AP funding. Modi has cheated A.P .. TDP chief Chandrababu, how do not you have the status of Chandrababu now asking for status? The Kamal Nathas are going to attack the counter. There are political criticisms between these two parties. If that is the case, today there is a disagreement between the TDP and the BJP on the one day BJP MPs across the country. Prime Minister Narendra Modi has called on the initiative of the Opposition in the Lok Sabha. He said he would make a one day fasting . The BJP MPs are part of this initiative. The BJP Rajya Sabha member GVL Narasimha Rao also initiated the initiative. But itseems that the AP government has not given permission. He said three days ago he was allowed for fasting in the Lenin Center in Vijayawada but did not give him permission. GVL said that the government had given permission to the CPI in the same place without giving permission for his initiative. He has also made a tweet to this. However, GVL has been given permission at Dharna Chowk in Vijayawada.